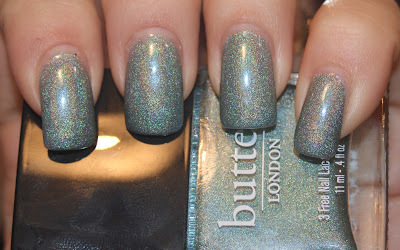 Today's polish is a US web-exclusive from butter LONDON called Fishwife! Fishwife is a dusty sage linear holographic polish with some major pop! It applied incredibly smooth and was opaque in just two coats, which surprised me immensely. It builds up really well. Here is a sparkle shot so you can see how pronounced the linear holo is in actuality. If you follow my Facebook page, you know that this was stopping people in their tracks inside of a Starbucks. I repeat... INSIDE of a STARBUCKS. They're not exactly known for their bright interiors, now are they? So what do you think of BL Fishwife? Is it your cup of tea? PS: On the subject of butter LONDON, check out my current Breast Cancer Awareness month giveaway, where you can win Disco Biscuit amongst other prizes! People stopping in Starbucks is EPIC. I LOVE Fishwife and glad we U.S. gals have something finally exclusive for us! 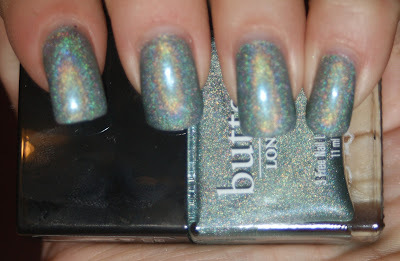 I adore BL's new holos, and for a holo - the formula rocks!! This is the last one of the batch I dont have yet and I am determined to get it this weekend!